Ixion aims to put Norway on the audio map with hi-res multi-room speakers | What Hi-Fi? 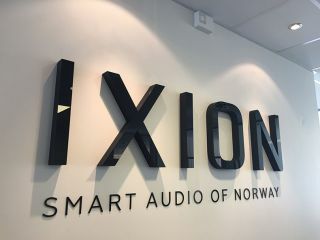 Ixion is a new name in Norwegian audio, albeit with plenty of pedigree in its ranks, and is set to launch in the UK with two multi-room speakers, the Maestro and Solo 2. Founded in 2009, the company has spent some seven years researching and developing its products, and is now ready to bring the Maestro and the Solo 2 to market. The speakers support hi-res audio, aptX Bluetooth, have integrated FM/DAB tuners and use power-line technology. But who is Ixion? The audio brand has its roots in Tandberg, an electronics manufacturer that began life in Norway way back in 1933. Ixion founder Tom Austad began his career at Tandberg and two engineers from the radio side of the business have since joined him at Ixion. Everything at Ixion is designed and assembled in a factory across the road from the main office in Tønsberg, around an hour outside Oslo. And with the Ixion name being taken from a particularly troublesome figure from Greek mythology, fitting Austad's desire to 'upset his competitors', the company means business. The first two products from Ixion are the Maestro and the Solo 2. They’re multi-room speakers, with the Maestro acting as the hub for your wireless system. One of the ways in which Ixion aims to set itself apart from its competitors is the way the speakers connect to each other. Rather than connecting via wi-fi, they use power-line technology. This means as soon as you plug a Solo 2 into a wall socket, it will connect to the Maestro and appear in the main Ixion app. This should mean the connection between the speaker and the app is quick, so adjustments such as changing the volume should happen instantly. An Ixion set-up allows you to move one song around to different rooms in your set up, or play different tracks in different rooms. At the moment, you can’t sync one track to play across multiple speakers, as you can on the likes of Bluesound and Sonos - you could technically play the same song on two or more speakers, but they'd be controlled individually. This feature is said to be at the top of Ixion’s to-do list, and the company has promised software updates in the not-too-distant future. The Maestro has a number of streaming services built-in, including Spotify, Tidal, Wimp and TuneIn radio, plus an FM/DAB/DAB+ radio tuner and aptX Bluetooth for streaming from mobile devices. Other connections include digital optical, RCA, 3.5mm auxiliary, USB and an ethernet port for a wired internet connection. Radio is still big business in Norway, and with the country set to be the first to switch off its FM analogue broadcasts in 2017, the inclusion of digital and internet radio tuners, alongside FM, is seen as important. The Maestro supports 24-bit/192kHz hi-res audio out of the box, while Ixion says an upgrade for MQA audio support is in the pipeline. There are three drivers: two 2.75in units at the front, which handle mids and highs, and a 5.5in downward firing subwoofer on the bottom. ixion says the drivers are made in the same factory as components for Audio Pro and Loewe products, but Ixion has specified custom designs. The Maestro is a 22cm-cubed speaker with a typically Scandinavian style, thanks in no small part to Bård Eker, the main in charge of design - and the man behind the Koenigsegg supercar. Bård says one of the most important design elements of the Maestro speaker is the feet. Not only do they provide a solid base but they make it appear lighter than it is. He compares them to a pair of stilettos, giving the speaker an air of elegance. In fact, the Maestro bounces on the feet, giving a solid base but also helping to adjust for resonance. Elsewhere under the hood you’ll find a quad-core processor to ensure usability is slick and efficient and a power supply that ixion claims is four times larger than needed. Why? The aim is to help reduce heat levels inside the speaker and in turn give it a longer life. Each Maestro speaker comes with a five-year guarantee. The Ixion Maestro is set to be available from May in grey, blue, white or red for a hefty £1099. The Solo 2 can’t be used as a standalone speaker, it needs to be part of a system with the Maestro. The only connection you’ll find on the Solo 2 is for the power and once connected you can access both speakers via the Ixion app. Each speaker has its own DSP, which will be upgradeable over the air, and up to seven Solo 2 speakers can be connected to one Maestro. Ixion has said it plans to introduce an update that will allow two Solo 2 speakers to connect together to create a stereo pair. The Solo 2 should also be available from May in grey, blue and red for a more palatable £399.